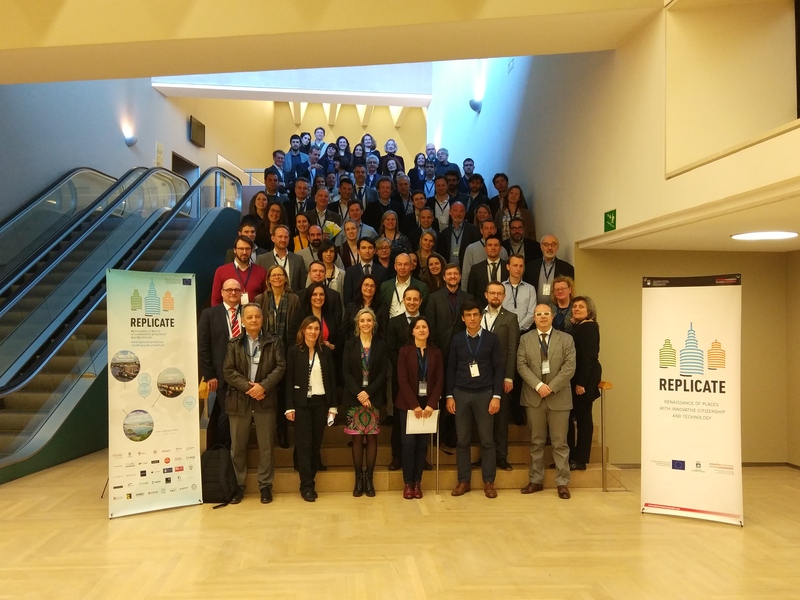 REPLICATE Project’s Lighthouse City of Donostia/San Sebastian organized last 26th and 27th of March the European Smart Projects Summit, where representatives and experts across 90 cities from 14 SCC01 (Smart Cities and Communities) projects funded by the H2020 Programme (Triangulum, Remourban, GrowSmarter, Replicate, SharingCities, SmartEnCity, SmarterTogether, mySMARTLife, Ruggedised, IRIS, MAtchUP, STARDUST, Making City and +CityxChange) shared their experiences and thoughts about the future of Smart Cities. The Replicate project, coordinated by Fomento San Sebastian, aims to develop and validate a sustainable city business model in the lighthouse cities of San Sebastian, Florence and Bristol to improve the transition process towards a Smart City in the fields of energy efficiency, sustainable mobility and ICTs/Infrastructures, accelerating the deployment of innovative technologies, increasing the quality of life of the citizens, and influencing the replication process. Representatives of Florence, Bristol and Nilüfer (fellow city of the project) also joined the event to exchange their experiences and visions on smart cities. During the first morning, public authorities from San Sebastian welcomed the public and shared key aspects of city. The EIP – SCC (European Innovation Partnership on Smart Cities and Communities) presented the Smart Cities and Communities opportunities and challenges. Participants had the opportunity to learn about the Smart City Strategy of the city of Donostia/San Sebastián, the Urban-China EU project about responsive cities & regions from the Austrian Institute of Technology, and to get to know experts Francis Pisani and Renato de Castro’s perspectives on how sustainable innovation can impact a city’s transition towards a smarter place. The Lighthouse Projects Cooperation Manifesto, that establishes a cross-project collaboration framework and a management structure to work together to enhance the impacts and benefits achieved through the projects, has included the 2 newest projects approved in the last SCC01 call, this cooperation was ratified by the signature of the Manifesto by the 14 lighthouse projects in Donostia/San Sebastián. In the afternoon sessions, project representatives shared experiences, key aspects and had a discussion about transformation of districts, energy transition, funding and business models of smart solutions, sustainable mobility models, citizen engagement and data governance. A study visit took place during the second day, the e-buses (from the Municipal company Dbus) took the two groups of participants from the city center to the Urumea Riverside District. During the visit, the attendees were able to discover the main actions carried out in the Replicate project framework. In the Txomin residential neighborhood the retrofitting intervention in 156 households and 34 commercial premises that Giroa partner is leading was presented. The District Heating system, owned by Fomento San Sebastian, that is already operative and that will give service to near 1.500 new households and to the 156 retrofitted ones was visited and main facts and experiences were shared. The city’s high-speed mobile wireless network implementation, managed by Fomento de San Sebastián and that has been improved by Sistelec in the project framework was also introduced. The experience about the Demand Side Platform that is being developed by Tecnalia was shared. The main features about the electric buses and the smart public lightning deployed by Leycolan were presented in the displacements. 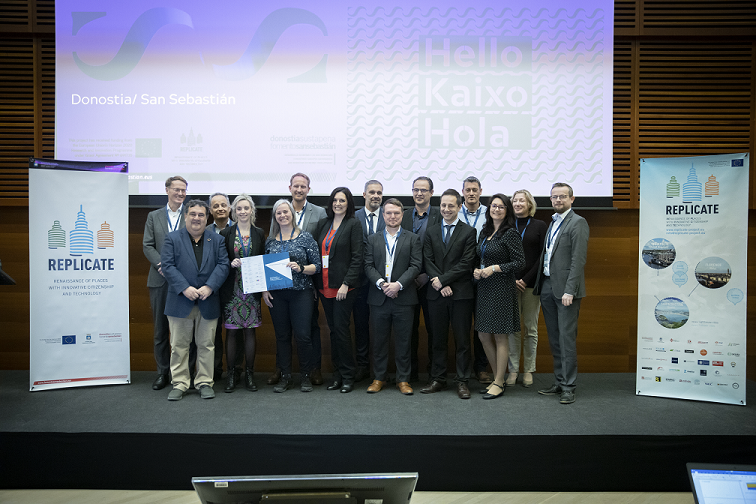 The Enertic Smart building with near zero emissions, hosted the presentation of the SmartKalea project, a public-private project of smart city deployments in the city, that is also coordinated by Fomento San Sebastian. DonostiaTIK (from the City Council), Ikusi, Euskaltel and Eurohelp, pilot project partners, presented their implementations about the Smart City Platform, Smart Mobility Platform, the use of big data for mobility services, the Linked Open Data and Citizen Participation Platform. Apart from the two e-buses, 4 electric vehicles for municipal purposes, 6 e-motos and 6 e-taxis were parked at the entrance of the building and the main challenges on e-mobility were shared by the San Sebastian City Council. All in all, the event was a great opportunity for the 14 Lighthouse projects and all participants to celebrate 2019’s first face-to-face meeting among the coordinators and task groups and to learn about the latest experiences on smart city implementations, difficulties, challenges and results. During the first semester of 2019 Replicate project is chairing the collaboration among the 14 lighthouse projects and in this framework, the European Smart Projects Summit was a great opportunity to bring together the different lighthouse projects and to exchange expertise among the smart ecosystem stakeholders.